Human life expectancy is increasing rapidly, with some current predictions suggesting that women will pass the 90-year mark relatively soon (well, those lucky enough to be born in South Korea in 2030 anyway). This is amazing when you think that just less than a century ago the average life expectancy in the U.K. in 1921 was 59 for women and just 55 for men. The fact that we’re living much longer (combined with increases in free leisure time) has meant that more and more older adults are taking part in serious sporting events and achieving things that would not have seemed possible even a few generations ago. Like Rob Barel winning the men’s 60-64 age group at the 2017 IRONMAN World Championship in Kona in a staggering 9 hours and 46 minutes—a time that would have placed him in the top 10 of the race overall well into the mid 1980s! It’s great to see more and more older athletes taking part in endurance events, but how does age affect things like recovery, nutritional and hydration requirements? I’m going to look at that last one in particular and discuss three common traits of ageing that mean getting your hydration strategy right all the more important as the years go by. Around 60 to 70 percent of your total body water is locked inside your cells in the intra-cellular compartment ( ICF), with the remainder sloshing around outside them as extra-cellular fluid (ECF). Because your muscle cells contain a large amount of your ICF volume, the amount of muscle mass you have has a big influence on your total body water levels. Losing lean muscle tissue is an inevitable consequence of getting older (especially past the age of 50), so it follows that your total body water content declines as you age. I’ve seen it reported that losing four to six liters of total body water between the ages of 20 and 80 is in the normal range, though there’s not a complete consensus in this area and my guess is that this may well vary considerably from individual to individual. Although training (especially lifting weights) can help to reduce the loss of muscle mass with ageing to a certain degree, it’s basically impossible to halt it altogether. With this loss of muscle you also lose a significant chunk of your “reservoir” of fluids as you age, meaning that dehydration when you’re sweating a lot can occur more rapidly than it can for younger athletes. Another thing that impacts hydration levels in older people is the fact that kidney function tends to deteriorate as you get older as well. Reduced kidney function means less concentrated urine can be produced and, as a result, more free water is lost when you pee. This may be compounded in some by a reduction in levels of aldosterone, a hormone responsible for helping your body hold onto water more effectively. 3. 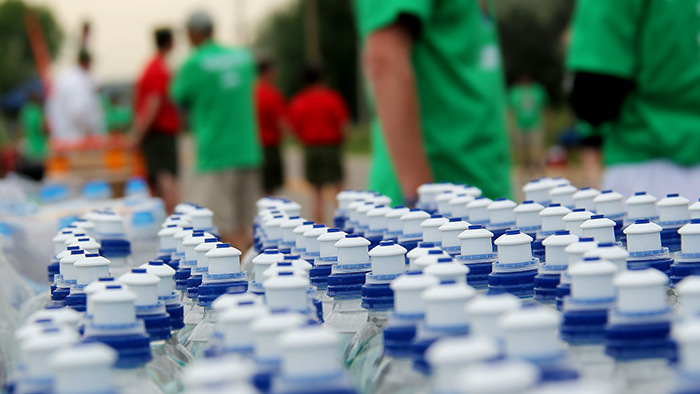 Your sensation of thirst is diminished, so, you guessed it—dehydration is more of a risk! A study published in 2001 clearly demonstrated that, whilst adults over 65 tended to drink sufficient fluids to maintain normal hydration status on a day to day basis, when their hydration levels were challenged by periods of sweating, their sensation of thirst—and therefore their tendency to rehydrate effectively—was compromised when compared with younger people. These three factors suggest that older athletes need to be a bit more diligent with their hydration practices than younger people as the margin for error is reduced and the risk of dehydration is increased. What can older athletes do to stay hydrated? This would be a good start. But, beware, I’ve written about the perils of dramatically over-consuming fluids before. In a nutshell, hyponatremia is a very real risk and this can really impact your performance and make you pretty ill, so that advice needs to be handled with common sense and care. Sodium helps you hold onto more water in your extra-cellular fluid and bloodstream and this reduces cardiovascular strain, helping you maintain your performance. It can also help you avoid cramp. The concentrations of sodium in your body fluids are finely balanced by various mechanisms, so it can be a sensible idea to add a bit of extra salt to your food, and/or some sodium supplements in your drinks, at times when you know your hydration levels might be challenged. Increasing your sodium intake also increases thirst, which should urge you to drink more too. If you’re an older athlete who struggles with hydration issues like dehydration or cramp after longer period of sweating, it’s worth taking Precision Hydration’s free online Sweat Test to help you get started with personalising your hydration strategy. And, if you have any questions at all, just drop me an email.